Bus from KL to Bachok is a typical "balik kampung" route ("Balik Kampung" means return to village in Malay). The service connects Malaysia capital with the small village in northern Kelantan. The bus service is mainly taken by locals going back to their hometown Bachok during off day. 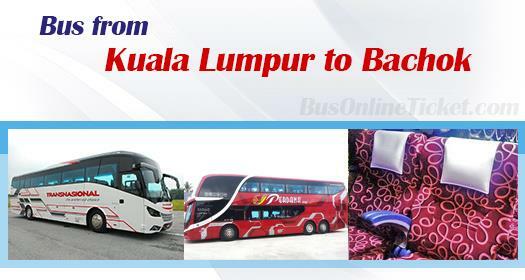 Perdana Express and Transnasional are the only two service providers supplying bus from KL to Bachok. Other bus operators rarely provide bus to Bachok from KL because of the smaller market demand. They each provide one morning departure from TBS (Terminal Besepadu Selatan) to Bachok. Because of higher demand for evening trip, Perdana Express offers two departures while Transnsional offers just one. Evening departure service is overnight coach. Passengers spend their journey in the night sleeping in the coach. By next day early morning, the coach would arrive in Bachok. Many locals prefer this travelling pattern because they could save their precious day time for their family and friend. The bus fare of KL to Bachok is reasonably charging at about RM 44.00, the same bus fare as KL to Kota Bharu. The journey from KL to Bachok takes about 8 hours depending on traffic condition. One stopover is provided for passengers' washroom break. Kindly note that the arrival points in Bachok for Transnasional and Perdana Express are different. Perdana Express offers two arrival points in Bachok. Passengers have the choice to alight either at Teluk Mesira Bachok or Tabung Haji Bachok. On the other hand, Transnasional coach terminates at Hentian Bachok. In the event of bus fully booked, passengers could take alternative bus to Kota Bharu. Bachok is only about 30-minute driving distance away from Kota Bharu. Passengers could easily take domestic city bus to Bachok upon arrival at Kota Bharu. BusOnlineTicket.com consistently provides excellent service to the passengers throughout these years. Therefore the portal has emerged as the popular transport ticketing portal in Malaysia.